^ "The Golden Age of 'Arthur' Comes to An End". Daily Collegian. Retrieved 31 March 2018. ^ Heben Nigatu. 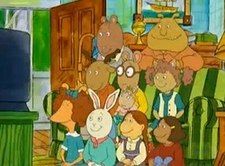 "17 Famous People Who Guest Starred on Arthur". Buzzfeed. Retrieved 21 December 2017. ^ "PBS Kids". Archived from the original on 2012-07-15. ^ Gordon, Jeremy. "Chance the Rapper Collaborates With Wyclef Jean, Jessie Ware on "Wonderful Everyday: Arthur" | Pitchfork". pitchfork.com. Retrieved 5 May 2016.